The Frank E. Smith Funeral Home, Inc. and the Johnson-Smith Funeral Home are the only funeral service providers in Lancaster and Baltimore, Ohio area that operates its own crematorium. By having our own on-site crematorium, we can control the whole process from start to finish, and your loved one will NEVER leave our care. Our cremation process is called Caring Cremation™. Unfortunately, most funeral homes in the area out-source cremation to third party providers. 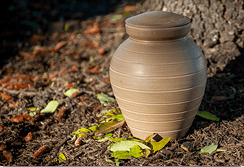 What this means is that your loved one will be dropped off at a third party crematory for the cremation, and then your loved one's cremated remains will be delivered back to the funeral home with in a number of days. The funeral home loses all control of the cremation process when this happens, and at Smith Funeral Homes, we find this industry practice to be unacceptable. Frank E. Smith Funeral Homes and Crematory. So how is the Frank E. Smith Funeral Home And Crematory with our Caring Cremation™ Service Different? Your loved one will be picked up from the place of death by a member of our staff. We do not use third party transportation services or vehicles. All of our cremations are performed by certified crematory technicians. Once at our funeral home, your loved one will never leave our care. You can inspect our facilities. Caring Cremation™ is the Frank E. Smith Funeral Home's nationally registered trademark that incorporates our particular cremation process. Due to our crematory design, the best available technology, and with our particular stringent methods and techniques of operating the crematory, we are able to obtain 38% more cremated remains for you, unlike the competition. Therefore, there are less co-mingled cremated remains. We will permit you to view the cremation process, which you can even start with the simple push of a button. We have a comfortable cremation viewing area where you and your family can have a service or committal ceremony before the cremation process begins. Because your loved one is always with us, and not with a third party, you can rest assured that our rigorous security procedures eliminate the possibility of misplacing your loved one's remains.